Now Available! A new book by Kevin Yoho. Awaken your own capacity to change the world. All you need to begin is this book and a box of crayons. Read the latest Book Review here! God loves your community. This new book can help you deliver what your community deserves. Available Now! — Leonard Sweet, best-selling author, professor (Drew University, George Fox University, Tabor College), founder of preachthestory.com. — The Rev. Dr. W. Wilson Goode, Sr. is director and organizer of the nationally acclaimed Amachi Program, a national faith-based mentoring model for children of incarcerated parents. Former Mayor of Philadlephia. Kevin figured out that urban neighborhood kids mirror rather than mask their true feelings. He learned how to use art and kids’ drawings to reveal the depth of their despair, and so you will see how the arts and school fit into the story of renewal. Bring hope to your community team! 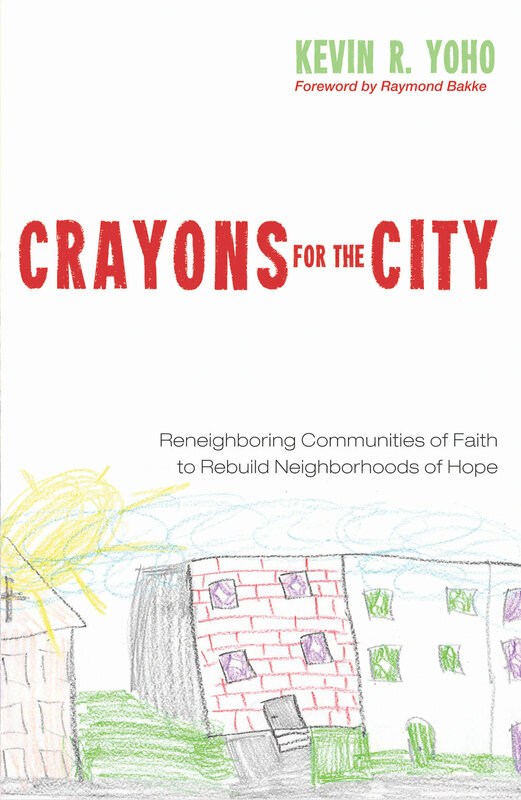 Purchase copies of Crayons for the City today from Amazon (author's Amazon Associate link), or direct from the publisher (click below), or wherever books and ebooks are sold. Purchase your copy direct from the publisher today! If you'd like a free signed bookplate, please complete the form below. I’ve had a cool sticker printed, and I’d be delighted to sign one and send it to you…free! (But I would appreciate a glowing review, of course! Post a review at your favorite site like Facebook, Goodreads, and Amazon. Thank you! I'd like a signed bookplate sticker! Where do you want the bookplate sent? — Bob Lupton, veteran urban activist, founder of FCS Urban Ministries, author of several book including Toxic Charity, Charity Detox, and Theirs Is the Kingdom. DESCRIPTION FROM THE BACK COVER: When a ﬁre severely burned a small boy and displaced his family, it left lingering marks on the entire neighborhood. As a community pastor, Dr. Kevin Yoho not only witnessed the visible signs of despair but also came to understand the pain hidden in the flames. He will be your guide as you step outside your organizational structures through the practice of what he calls reneighboring. Crayons for the City is about training leaders to be a new kind of community network engineer who will realign their organization’s priorities, resources, and values to serve the public good. It’s a story about how one community of faith improved the lives of hundreds of families by taking a walk across the street with fresh expressions of the good news. How do leaders grow and change—from holding on to ineffective ministry models to building new connections of grace and gratitude? The journey is not an easy one for most. Crayons for the City starts with the reader’s own context and offers a new methodology of how to engage it. Awaken your own capacity to change the world. All you need to begin is this book and a box of crayons. Available from Amazon (Affiliate Link) or directly from the publisher, Wipf and Stock.